What foodie in America -- nay, in the entire world -- wouldn't love to do a food tour of New Orleans? I know I would. But you know how it goes: when I have enough money to travel, I haven't the time. And when I have the time to travel, I'm dead broke. I do, however, have a sinfully delicious piece of New Orleans sitting here before me, courtesy of the good folks at Sucré. Sucré is a New Orleans based company that, in addition to making some beautiful-looking chocolates, has what appears to be my dream café. They have candy, desserts, coffee and espresso, gelato...oh my, I am about to swoon just looking at it! I think I could walk all the way to Louisiana, just to visit that one place! OK...I'm alright now...breathing a little rapidly, but in control. So where was I? Oh, yes. 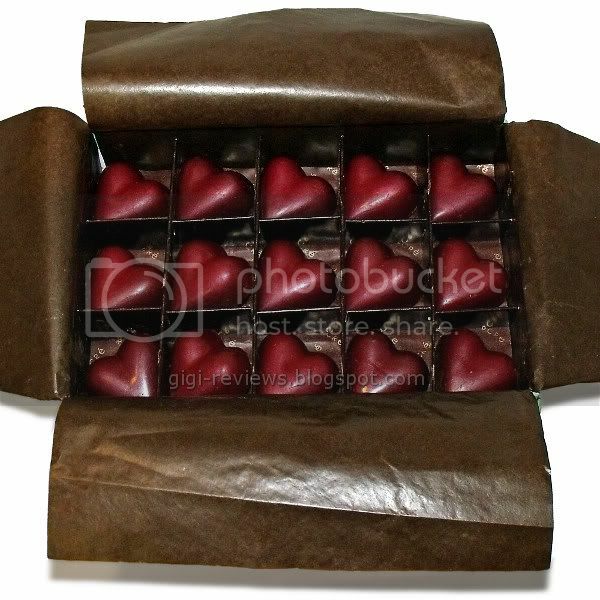 Just in time for Valentine's Day, Sucré was kind enough to gift me with this box of beautiful, heart-shaped candies of dark chocolate ganache blended with raspberry. I am not a Valentine's Day kind of person (I want cool gadgets, not flowers or other such foofy items), but if I was, this would be a very pretty gift to get. 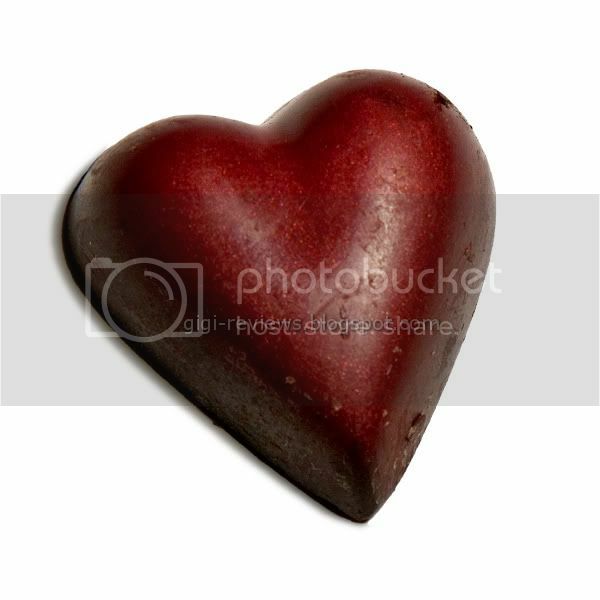 Each heart is perfectly molded and coated in a vibrant, slightly metallic shade of red. It's the type of red I would like to dye my hair...but, as with most of us in the real world, my personal appearance must gibe with corporate guidelines. Oh well. I can dream, can't I? I gave the chocolate a sniff before biting into a piece. It has kind of a cocoa smell. Once you do bite into it, the smell of the raspberry wafts up. The outer shell is surprisingly thin, but it adds a nice bit of almost snappy texture. The ganache filling is cool on the tongue and super smooth. Sitting directly on top of that (just under the lobes of the heart) seems to be where the raspberry may live, although there is no visual trace. The ganache is milky and rich, and paired with the woodsy dark chocolate of the shell makes for an amazing combination. I could keep adding pretty words all night, but let's just leave it at this: I ate five hearts in one sitting! And if not for the fact that I like to think I have a little self restraint, I could have easily eaten more. Like the entire box, maybe. What maybe? I definitely could have! 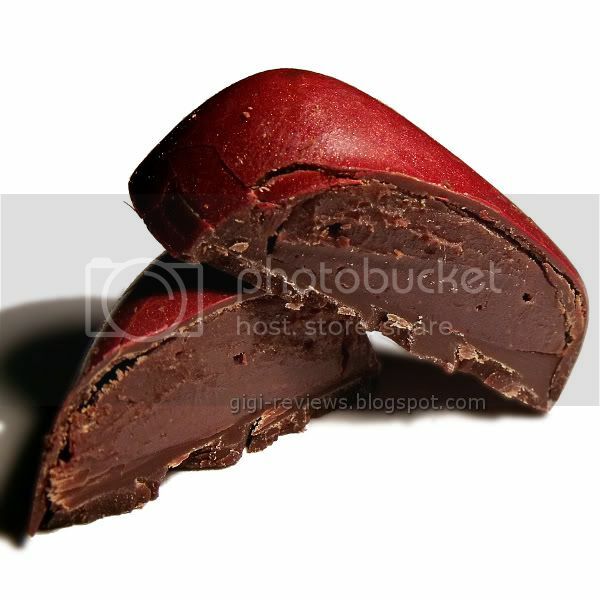 This is, without doubt, my favorite raspberry truffle ever. May contain nuts or nut oils.